Topics: Heywood Collection, The Garden Railway. With the arrival of "Ursula" a couple of weeks before Christmas, a Boxing Day steam up was an inevitability given a bright, clear day in prospect. She hasn't been steamed since our 2016 Open Day at the works, on a cold December morning it took Sludge a couple of goes even to get her pulled out of the shed. We got a fire in at 9 o'clock, then settled down for a leisurely cleaning session as various friends and neighbours arrived over the next couple of hours. Much brass was polished, tea drunk and sausage rolls eaten until we were ready to move off shed just before midday. Choice of rolling stock at the moment comprises our Eaton Railway ballast wagon, Duffield Bank 1 ton wagon or the Eaton bogie brake. The brake van got the job, with room for four inside and two at each end! The shed has been fitted with temporary doors to keep the weather out, one of the jobs for 2018 is to finish it off - connecting up for electricity, it needs the other three roads laying and concrete footings putting in for drill and lathe. Elsie discovered the guard's flags, which were waved with enthusiasm (if with little attention to when or where the train might be starting or stopping) throughout the day. 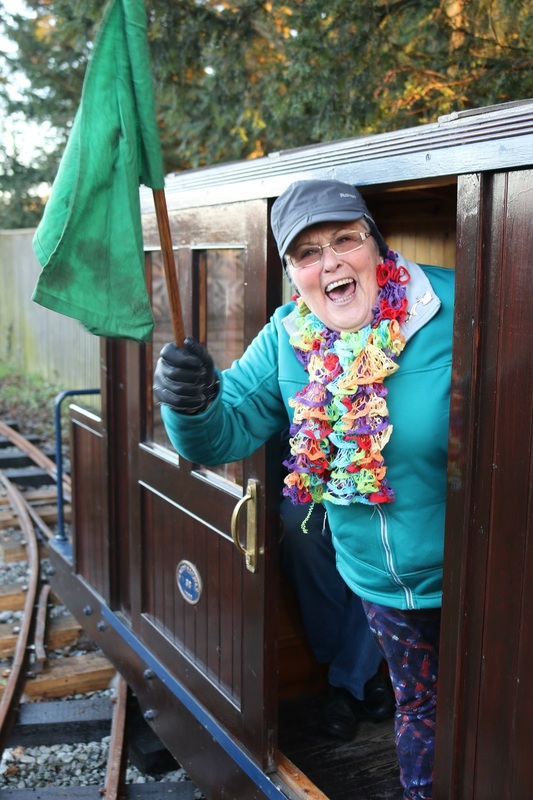 After an hour of running up and down, Sister Maureen from the Franciscan order next door appeared - she's somewhat of a steam fan and has waited patiently much of this year for a locomotive to arrive on the railway. We are much in the sisters' debt, they have put up with our noise and commotion uncomplainingly over the last 12 months - Sister Maureen's reward coming by way of a footplate ride with James. She turned out to be a rather spirited driver, setting a new "there and back record" on Ursula. By late afternoon, as it was getting dark, we put all the toys away in the shed and headed indoors for a warmup and supper round the kitchen table. A thoroughly nice was to spend Boxing Day! For those interested, there's a video of the day here.